Location/ Directions: Travel I-77 to Exit 109 (Everhard RD/Whipple AVE). Turn left onto Everhard RD, turn right onto Stratmoor DR, turn left onto Broadmoor Circle. The hotel is on the left. About Hotel: 4-Floors, 89-Rooms, Interior Corridors, Easy to Set Alarm Clock Radio, Ergonomic Desk Chair, Coffee Maker, Complimentary Hot Breakfast, Hairdryer, Free High Speed Internet, Iron/Ironing Board, Lap Desk, Newspaper M-F (USA Today), Free Parking, 32" flat screen HD television, Fitness Center, Indoor Pool, Whirlpool, No Pets allowed, 100% Non-Smoking, Free hot breakfast. Railroad View: Excellent View from rooms on the rear of the motel. Railroads past Hotel: Wheeling & Lake Erie Railroad (freight) / Cuyahoga Valley Scenic Railroad (tourist). This is a former Baltimore & Ohio Railroad line that runs between Canton and Akron, OH. The W&LE (WE) operates freight on the line at least twice a week, and CVSR operates scheduled tourist trains. See the CVSR web site for Canton schedule. This is not a busy railroad line. 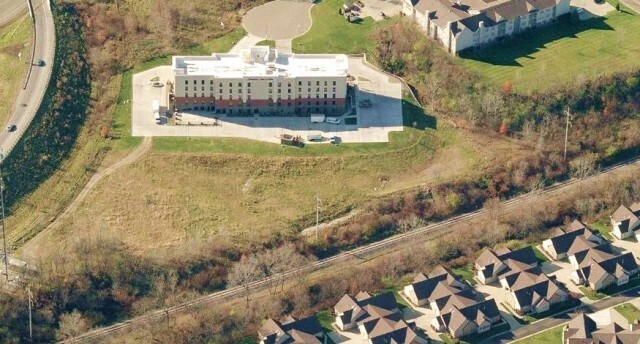 Photo Comment: The aerial photo shows the Hampton Inn as the main building pictured. The single track railroad can be seen between the houses and the motel. Don't expect trains to pass the motel during the night, only local freights and tourist trains use this line.